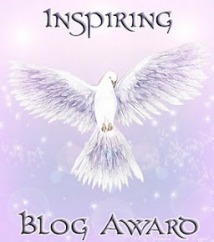 Although I hardly think of myself as inspiring, the lovely and talented J.C. Martin nominated me for the Inspiring Blog Award all the way back on June 11th. Thank you, J.C.! Please check out her novel, Oracle which comes out July 30, 2012. I've read it and it is incredible! So the rules are that I have to tell you 7 inter-related facts about myself and then nominate 7 people I find inspiring. (It was the whole inter-related thing that tripped me up--that's why it took me so long to come up with this post!) Anyway, here goes! 1. I love to drive. Have always loved to drive. 2. I do my best writing-related brainstorming while I'm driving. 3. 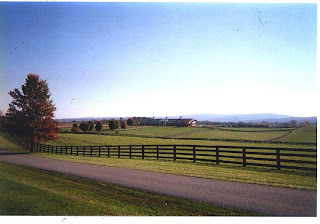 I once drove from Atlanta, Georgia to Bloomsburg, Pennsylvania in a single day by myself. I left at 5 a.m. and arrived at 8 p.m. (If I remember correctly). I nearly got killed on a highway in South Carolina, drove through a torrential downpour in Virginia and got a flat tire at the border of Pennsylvania. Good times. 4. I once listened to Dean Koontz's False Memory while driving from Pennsylvania to Kentucky in the middle of the night. Travel tip: do not listen to creepy books while driving through West Virginia at 3 a.m. during a lightning storm. You won't sleep for a week. By the way, only hours before that I had driven from Lake Placid, New York to Philadelphia, PA and hours after I arrived in Kentucky I drove to St. Louis, Missouri. 5. I once drove from St. Louis, Missouri to Astoria, Oregon in just a few days (There was one leg of that trip where we drove straight through for 36 hours if I remember correctly) and saw a double rainbow in Western Nebraska with my dad. 6. I used to drive 40 miles each way to work and much of Finding Claire Fletcher was written in my head during those drives. 7. I even bought one of those mini-cassette recorders for the car but never once used it! 1. Nancy S. Thompson: talented and tenacious! 2. Carrie A. Butler: blogging goddess and holy blog banners, batgirl! 3. Jeff O at The Doubting Writer: his writing is like rich, decadent chocolate! 4. Joylene Butler: overcoming incredible odds and staying committed to her writing! 5. Cassie Mae: How does she get and keep all those followers? By being herself, of course! 6. Michael Infinito: always knows exactly what to say! 7. L.G. Smith at Bards & Prophets: she is consistently intriguing! Finally, check out this blogfest that Falling For Fiction is hosting! It sounds like great fun. On July 16th post the first sentence from each chapter. On July 18th post the last sentence from each chapter. Post as many as you like, your first 3 will be judged. Get more details and sign up here. Stay tuned for a guest post by R. Mac Wheeler! Double rainbow - what does it mean??? A horror book at night does sound like a bad idea. Thanks for the award, Lisa. That's a heck of a lot of driving to do! Oh, I LOVE to drive, too! Not long drives, mind you, but fun, scenic ones. Luckily, we have many where I live & I have a fun car to do it in. Get ready for another long drive, Lisa. I can't wait to meet up with you in Cleveland in a few months!!! It'll be epic!!! You guys should rent a car and take a scenic drive through Ohio! Oh a horror book at any time of the day would creep me out, lol. But I'd be constantly checking my back seat. thanks for the award and for spreading the word on the blogfest!!! I love to take road trips. Never realized how much until about 5 years into living here, where there are around 3 roads in this whole huge state. You can either go north or south. Period. We've been pretty much everywhere on the road system now and I'm missing the interstates in the Lower 48. Amazing that you can drive for 3 hours or so and be IN A DIFFERENT STATE. o_O It takes 12 to get from Homer to Fairbanks and that isn't even close to being the whole state. I think I signed up for that blogfest. So, you like to drive :) interesting facts about you Lisa. I loved this rather eclectic post - wows - (I'm a driving phobic - no really!) and congrats on the award. Driving while cranking my Ipod helps me zone into story ideas too! And I read Intensity by Dean Koontz while driving around the country in a van, SOOOOO not a good idea. SCARY! Thanks for the shout out for the blogfest :) Happy 4th!